KATHMANDU, Nepal (CNN) -- Nepal's government ordered the country's army chief of staff fired Sunday, touching off street protests and a split in Nepal's Maoist-dominated ruling coalition. 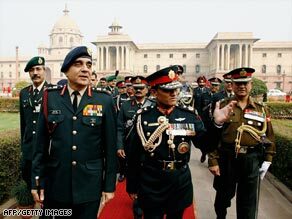 General Rookmangud Katawal gestures after inspecting the guard of honour in New Delhi on December 12, 2007. But Gen. Rookmangud Katawal has refused to accept his dismissal, and Nepalese President Ram Baran Yadav -- the constitutional commander-in-chief of the country's armed forces -- has told Katawal to remain in office, a presidential spokesman said. The move prompted the Maoists' largest coalition partner to quit the government, the party's leader said. "Without consensus, the ongoing peace process will not reach its logical conclusion and the drafting of the new constitution will not be possible," said Ishwor Pokharel, general secretary of the Communist Party of Nepal (Unified Marxist-Leninist). "The consensus that existed so far has come to standstill." Supporters of both sides in the dispute took to the streets for demonstrations Sunday. Despite sporadic clashes between the two factions, there were no serious injuries reported. But two weeks ago, the government asked Katawal to explain why he went to the Supreme Court to challenge the government's refusal to extend the tenure of eight brigadier generals in March. Government spokesman Krishna Bahadur Mahara said Sunday that the government was not satisfied with Katawal's explanation and fired him -- three months before his scheduled retirement -- in a meeting that the Maoists' coalition partners boycotted. Pokharel said his party urged the Maoists not to fire Katawal without a consensus in the country's parliament. He said the Maoists, led by Prime Minister Pushpa Kamal Dahal, ignored that advice. "We do not like the way the Maoists' way of functioning," Pokharel said. The Maoists hold 238 of the 601 seats in parliament, while Pokharel's party has 109. The Maoists could continue to hold power with the support of smaller parties, but Pokharel said his party is working to form a new ruling coalition. The Cabinet named an interim army chief, but presidential spokesman Rajendra Dahal told CNN that 18 parties in Nepal's parliament asked Yadav to keep Katawal on the job. There was no immediate reaction from the government on the president's decision.